Social work volunteers share their experiences from Girasol’s spring trip to the U.S./Mexico border. Girasol’s Social Work Detention Response Team at the U.S./Mexico border in March 2019. This is how it feels today when you go to the U.S./Mexico border. 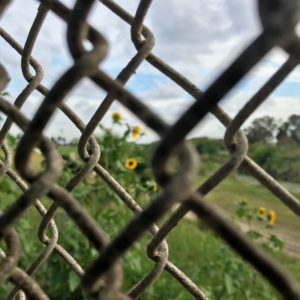 In March of 2019, TXICFW’s Girasol team took a total of eight social work student volunteers to the U.S./Mexico border. 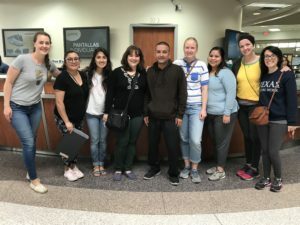 This multi-lingual, dedicated team drove 10+ hours over a single weekend to provide relief and support in the border town of McAllen, TX. 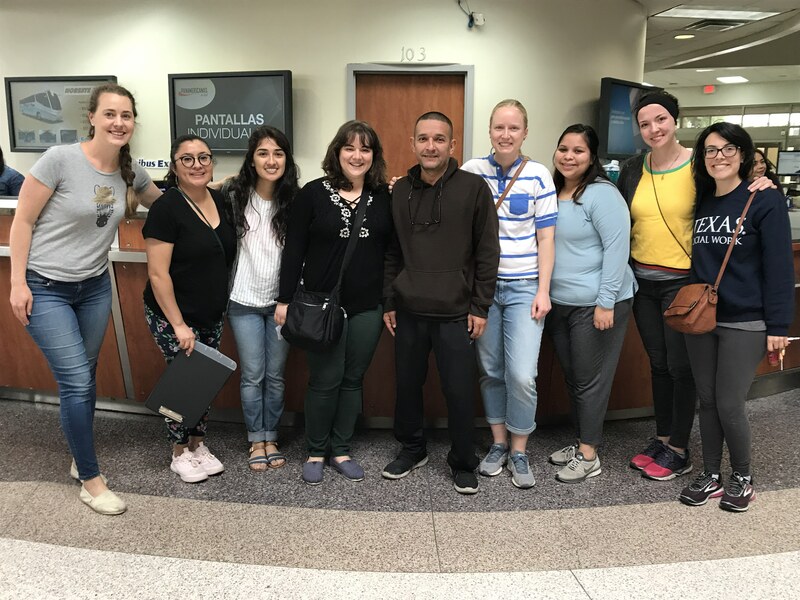 While the trip was brief, their scope was large: Girasol volunteers worked to support a humanitarian respite center that receives 300-400 migrants each day. 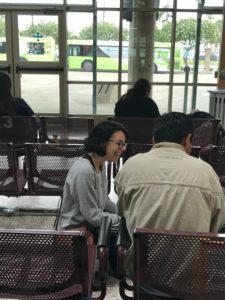 In addition to providing directions, supplies, services, and general support, Girasol also helped staff a bus station to provide migrants with access to information about their trips and their initial court appearances. This summer, we are working hard to grow our social workers response team to twelve student volunteers by raising money for these trips through UT HornRaiser. In honor of this final stretch of our 30-day HornRaiser campaign, we wanted to share some reflections from our team about what it is that your donations will be going towards and the impact that this work has on us as social workers. How were you able to use your social work skills at the border? Social work volunteer Lynn Panepinto helps provide an orientation to an asylum-seeking father traveling with his family. Lynn: The ability to remain calm and regulated felt like the most important contribution we could make. Kelly: My social work skills were critical in my ability to manage my own emotions and more effectively support the migrants. The modest knowledge I have of interpersonal neurobiology led me to expect that working closely with people undergoing a traumatic experience could evoke strong emotional reactions and that I’d need to be compassionate with myself. Sarah: At the McAllen bus station, everyone was so appreciative for our most humble offerings of support and empathy. Our contributions felt small, but had undoubtable healing value. Beyond directly applicable clinical skills, this experience also challenged me to reflect on the broader structures and systems that shape the migration experience. I don’t have the solutions yet, but our trip compelled me to think deeper about how we can build service and advocacy coalitions, bridge delivery gaps, develop alternatives to detention, and involve social workers in the convoluted and opaque asylum process. Ana: I was regulated and grounded, with the intention that (even for a brief moment) they would feel that way too. I worked to be mindful during my interactions with asylum-seeking families by sitting on the floor and returning control to them. I also involved children into the process by encouraging them to trace the cities that they would pass through in order to complete their journey. What stood out to you about the challenges that asylum-seeking families face? Kelly: It was glaring to me how little government officials would have to do to make a huge difference in a migrant family’s experiences at the border. If groups like Angry Tias and Abuelas and Catholic Charities can fill so much of the gap in needed services, more support from the U.S. government could make things immensely better. The current political climate is oppressive and violent to migrant families in its lack of action just as much as it is in the actions that do take place against them. Sarah: I was surprised by how little information had been shared with migrants about the asylum process itself; what to expect and what their responsibilities are. It was clear that there are no formal structures in detention or immediately post-release to educate families on how to navigate this complex world if they hope to succeed in their legal cases. Many people were even surprised to learn that they needed to seek out a lawyer on their own, and that doing so was the biggest determinant of their case moving forward successfully. Dora: Families are often traveling with young children for several days on Greyhound buses without enough diapers, blankets, cough/medicine, sweaters, etc. and with the extra challenge of navigating their bus itinerary without English language skills. Thankfully, McAllen and the greater South Texas region is a Spanish-speaking dominant area so it makes that process slightly easier. However, that is not the case the further north you travel within the U.S.
What is one moment that will stay with you from your experience? Lynn: When we were preparing to leave the McAllen Greyhound bus station after helping to orient migrants there, I was feeling sad because we had run out of snacks to distribute to people for their journeys. Then I noticed a group of volunteers walk in and distribute brown bags of food to people and it gave me a sense of relief and hope, knowing that we are just one piece of the larger puzzle of people who are doing this work and striving to support migrants and their families. Kelly: I remember seeing a little girl who was about 4 or 5 playing with a group of kids at the bus stop with a toy I’d given her a few hours earlier. She was holding it above the small group and saying, “Quién quiere esto? !” (who wants this?!). The other kids replied, “Yo, yo!” (me, me!) They each took turns holding the toy above the other kids. It didn’t occur to me until the next day that they may have been using play to process what they witnessed at the respite center where their parents received donations. Children are incredibly resilient. The Spanish word “Girasol” translates to “sunflower.” They were in full bloom during the Girasol team’s trip to the border this March. Monica: Walking back over the bridge to the U.S. in minutes, leaving asylum seekers on the other side and passing the line of non-citizens waiting to enter. Sarah: In the final hour of our time at the McAllen bus station, I took a moment to just pause and absorb the scene in front of me. Mostly families, lots of young children, and the occasional solo migrant. Dispersed throughout, seven fellow social workers, all seated on the tile floor, looking up towards the families on the chairs above them. We usually sat on the ground, both for practical and space reasons, but also to intentionally ground ourselves, ease into the conversation in a gentle way, and chip away at the power differentials that exist between privileged graduate students and vulnerable asylum-seekers. I felt a lot of pride seeing my fellow volunteers in such a visible, symbolic expression of humility and service to others. Dora: It’s always heartbreaking and upsetting to learn about the verbal abuses and humiliation asylum-seekers experience within CBP processing/detention. Often, families are surprised there are volunteers willing to sit and exchange kind words with them. Ana: Witnessing two men who were from the same country reunite at the Respite Center. “You’re here,” one said with overwhelming joy at seeing the other. “I’m here,” said the other. They hugged each other—they both knew how difficult the journey had been and they both knew that it had not ended. No other words were said as they held each other. There was no need. Then, one man said “I see you,” and waved goodbye, and the other man smiled. This interaction was very moving. We thank you for your support, and we look forward to sharing more of our stories after our summer trip. To donate to our HornRaiser, visit us here.